How often do we spend our time fretting about not having enough time? It seems to fly by. And the more stressed we are, the faster it goes. In our fast-paced society, there’s a common thread in most of our lives – we don’t have enough time. Most of us would love to find more time – for the things we have to do – and for the things we’d rather do. 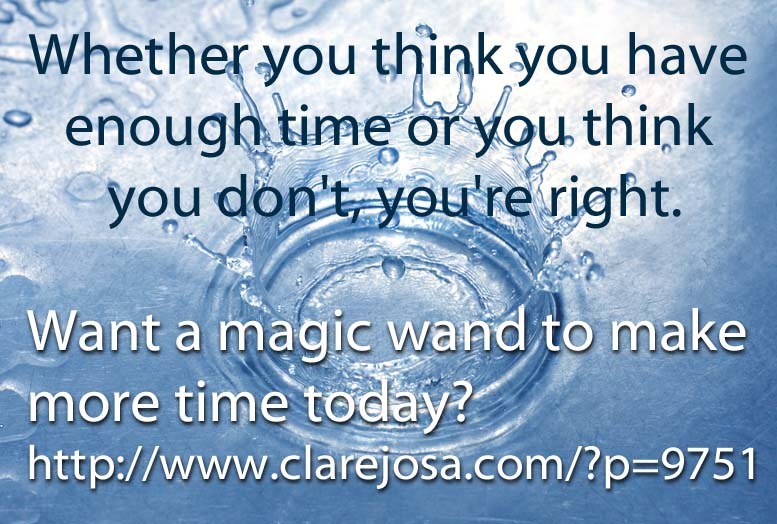 I’d like to share with you a near-magic-wand for creating more time in your day. It’s a single gratitude phrase – a mantra – that you can choose to say, with mindfulness. And its effects can feel miraculous. The way we feel about time is determined by the stories we tell ourselves about it. And the stories we tell ourselves about time dictate how much of it we have. Whether you think you have enough time or you think you don’t, you’re right. Time is largely a matter of perception. When we convince ourselves that we don’t have enough time, we trigger the body’s sympathetic nervous system’s ‘fight or flight’ stress responses, setting off chemical reactions that pump you full of adrenalin and other stress hormones. These shift your thinking to the primal part of the brain, responsible for life-or-death short-term decision making, meaning it’s harder for you to concentrate and you will get less done. It’s as though getting stressed about time steals time form you. Yes, sometimes we don’t have enough time. But mindfulness can help you to make the most of the time you have. We all have the same number of minutes in a day. And, within reason, we have a huge amount of choice over how we spend them. The whole concept of ‘have to’ and ‘not enough time’ is a story concocted by the good old Monkey Mind, based on the diet we have fed it over the decades. So how can you magically create the feeling of having more time? By being grateful for the time you have. Could This Be The Solution To Not Having Enough Time? Take three mindful breaths, breathing in through your nose and breathing out with an ‘ahhh’ sound, as you relax, release tension and come back to this present moment. Allow yourself to settle in your body, rebalancing the body’s stress and relaxation systems for a few moments. I am grateful for the time I have. Consciously choose to focus, mindfully, on feeling grateful for the time you have. Notice the shift – you’ll feel it in your body and mind. After all, this moment is all the time we’re ever going to get, so why on earth waste even a moment of it by feeling grumpy about it? I invite you play with this technique for a few days and notice what happens! I’m curious: What are your ‘time stories’? Did this gratitude technique bring anything up for you? Any insights from using it? Any questions? Feel free to share, via the comments box, below. Thanks! P.S. This technique is based on one from my book Gratitude: A Daily Journal. If you’d like to discover how a few minutes a day of gratitude can transform your life in just a couple of weeks, then it’s worth checking it out! And if you’d like to experience how mindfulness can help you to cut your stress levels, in under sixty seconds, then you might enjoy 52 Mindful Moments. 7 Lessons That Meditation Could Learn From The World Of Zumba! What have Zumba and meditation got in common? You might be surprised! Watch this video and then, if your heart is calling you, join us at http://www.28DayMeditationChallenge.com to discover how 10 minutes a day can change your life! Want to join us and discover how 10 minutes a day could change your life? Sign up today and you could be getting started in the next 5 minutes! www.28DayMeditationChallenge.com. Last Call For Miracle Of Gratitude – Inner Circle! If your heart is calling you to dive in and experience how the Miracle Of Gratitude could change your life – fast and forever – then you won’t want to miss this! Last chance! [Read more…] about Last Call For Miracle Of Gratitude – Inner Circle! We have all heard about the ‘attitude of gratitude’ and how we’re ‘supposed’ to think positive thoughts. But how on earth do you do it? How do you take the ‘stuff’ that life throws your way and turn it into smiles instead of sulking? Here are 10 reasons why you might want to use a gratitude journal to help you with all of this – and why you’ll want to make a start today.